Complementary page on KnifeThrowing.info: Knife throwing for self defense? As of April, 2000, we are honored to have three interesting interviews to share. The first with Mr. Tom Sotis of the International Blade Fighters Guild, the second with Mr. Vladimir Vasiliev of the Russian School for Martial Arts in Toronto Canada, and the third with Professor Amante P. Marinas, Philippine stick and knife fighting master, and author of Pananandata Guide To Knife Throwing These are three guys I would definately want on my side in a bar fight! At the end of these interviews are more links to self-defense related throwing. Trains SpecWar groups world wide. Holds the title of Special Advisor to the Russian Spetsnaz and other military groups. In U.S. trains members of various Federal, State, and Local law enforcement agencies. Lectures and teaches on the martial-arts circut internationally. I first contacted Mr. Sotis as the result of seeing a posting of his on the usenet group rec.knives. I asked him if knife throwing ever figured in his self-defense philosophy. He answered that it did, if rarely. I asked then if he would be willing to write something about it, and suggested a set of questions that he might authoritatively address. He began by answering a few of them in his reply to my mail, and this suggested to me a sort of interview format. I will include below the question, and Mr. Sotis' reply. I wish to thank Mr. Sotis very much for his time and effort in this regard. From him, I receive an interesting and expert opinion on the subject of knife throwing in a self-defense context. From me, he gets only a little publicity, and perhaps a future student or two. Under what circumstances would it ever be appropriate to throw a knife in self defense? TS. Most often you might throw your knife when there is a third party involved. For instance, someone is going to shoot your friend. You have a knife but cannot close the gap before your enemy will pull the trigger. You MIGHT opt to throw the weapon - as you close the gap - and kill them empty handed. If your friend is moving (and therefore a harder target to hit) you might opt to retain the weapon, close the gap and finish them. When facing a single enemy, I personally would not throw my weapon. A knife is a close range tool, and as such, is weilded most effectively in it's intended range. Most people, even seasoned martial artists, are often surprised and unsettled by what a trained knifefighter can do in just a second or two. The mentality reflected in the execution of the techniques (and the enemy) is more of the real issue here. The bottom line is...most balanced and decent people are repulsed by the idea of a blade piercing flesh - anyone's - even the enemy. Take a personal poll and ask friends around you if given the choice, would they rather be shot or stabbed. Almost without exception people will opt to be shot. It's less personal. Since guns existed at the onset of American history, we have become a gun culture not conditioned to accept death by the blade (as lets say for instance - in the Philippines, where I was trained, or Indonesia). The truth of the situation lies in knowing that: any mortal conflict requires spirit first and tactics & techniques second. So, who would throw away the BEST tool to have in close range? Someone afraid to hold the knife, close the gap, and do what must be done - up close and personal. But then again, this is just my opinion. With study, practice, and experience - people should make up their own mind about what is right for them, follow that way, and ignore ignorant uninformed criticisms. Do you throw to kill or stop the attack in that act, or merely as a distraction while following up with another weapon or possibly fleeing? If the idea is distraction, possibly some other object is better than a knife, for example stars, or rocks? TS. When you do close the gap, the knife has hand has six basic uses: Pommel strike, fist strike, cut (press of the blade), slice, thrust, and gouge. The free hand has TWELVE uses. Checking, dictating, leading, preventing and removing checks, eye jabbing / prevention of, gunting/striking, locking and releasing, disarming / prevention of, head control, trapping, binding, and introducing variables. The last one - introducing variables - is for hankerchief, belt, coins, eyeglasses, wristwatch, or anything from your environment used to distract and create an opening. Would you consider carrying two knives, one specifically for throwing? TS. If I had two knives I would use them both (we practice and teach double knife fighting) If I had three - then I might throw one. Well then, what would you want to see in a knife designed for throwing in self defense? TS. Specialist Steve Perrin has impressed upon me the value of learning how to throw various designs, so that you may adapt to environmental weapons. I have tried the various Hibben designs, and the Blazing Arrow, darts, etc. In the final analysis I prefer the "Professional Throwing knives" found in common knife catalogs like "the Edge". I can hit consistently and at varied distances, but again hitting a moving target is different. Steve put handles on the back of our backstop and charged. Try it. Even if you are a good thrower - if you are not used to it - it will be a humbling experience. Add danger, fear, fumbling fingers, uneven terrain, poor lighting, light in your eyes, slippery ground, multiple opponents, armed adversary, or any of the other 500 variables of combat. Get the picture? I think people should spend less time postulating and theorizing and more time testing, evaluating, studying, asking better questions, testing some more, gathering personal experience. I will forever be a serious STUDENT of the blade. Learning to use that which is available make plenty of sense. Yet the "professional throwing knives" you speak of are typically too short and light to be considered seriously by sport throwers. You would have to be able to throw with arm-wrenching force and be very very good - reliably hit your opponent in the eye - for them to be anything other than nusance weapons. TS. Yes they ARE light,and my shoulder was screaming after hard throwing sessions. If I were serious about throwing for defense, I would do an indepth study of every design, buy or make them, and practice, practice, practice. THEN I could give you a more educated opinion. I hesitate to be quoted as an expert outside of my specialty of applying it on an enemy hand-to-hand. The "professional throwers" all prefer knives exceeding 12 inches in length and weighing in at around 1 oz./inch. This gives them some serious damage potential (though its the momentum the sport thrower is after), but may render them impractical for carrying on the streets. Does this bring any thoughts to mind? TS. A heavier knife makes sense in terms of pentration or impact damage. Maybe an upside-down over the back sheath for easy access to a larger weapon? I live in New England where people wear jackets much of the year. Again, match the design to the purpose and train, train, train. What would you target? Do you throw toward a "center of mass" as many shooters are trained to do? TS. I prefer face/head throws - it's always open. In our playful throwing competitions - I aim for the nose that way I'll usually get either eye or the mouth. I'll be happy if I hit the face anywhere on a charging enemy - sticking it or impact damage, either way I'll use the distraction of the moment to finish him. If he's charging, throw it at about 10 feet into his face, secure your "finishing blade" and follow up. Do you teach particular grips to use, and stances from which to throw? TS. Practice in every way that you can think of to simulate the changing chaos of combat, the statement is so simple it seems obvious, but its exploration is wide. My final advice? If you want to throw for self defense purposes - find a knife with which you can stick consistently, and practice, develop, and practice more - every drill you can utilize to simulate various aspects of combat. I would like very much to thank Mr. Sotis for his time and effort here. He has truely contributed a great deal to the quality of the thrower web page. Mr. Sotis can be reached by email (see link at top of page), but cautions that he receives much mail and may not always be able to reply in a timely fashion. Vladimir Vasiliev formerly served in the Soviet Army and learned that special martial art form known as "The System" He currently resides in Toronto Canada and teaches "The System" through his own acadamy of Russian Martial Art! I had heard about a video entitled Knife Fighting and Throwing by Vladimir, showing off The System as it applied at least to its specific subject. I called the number listed on Vladimir's web site listed above and spoke to Vladimir's wife. She kindly offered to send me a copy, and in exchange, I promised to list and review it on my Books and Videos page. After receiving and seeing the video, I wanted to ask Vladimir more specific questions about his knife throwing technique. Vladimir is still more comfortable in Russian than in English however, and so I am very indebted to my co-worker and friend Vladimir Rubashevsky for his willingness to spend some time with me interviewing Mr. Vasiliev and then translating the results into English so that I could make them available to you! In your video you make the claim that a knife can be thrown from 1 to 5 meters without rotation. Your illustrations though look to be about 1 to 2 meters. Can people really throw that far without rotation? Yes i'm not going to lie to you, this can be achieved.. In the video you show a grip [ Ed. note 1], but it is unclear how this by itself achieves a rotationless throw. Hold knife in a way that it slips from hand. The knife should slip off hand when throw. First when trying to reset, the throw is being done by your hand only. You can throw 1-2 Meters, depending on how hard you throw. The knife does not have to be balanced. Try to figure out the center of mass by feeling the weight in your fingers. You may throw from below the level of the target or above it depending on what is heavier, the handle or the blade [Ed. note 2]. To throw from 3-5 meters, use the elbow, arm, and shoulder. Here main point is not to cross the line between you and the target, and to keep your hand, and elbow above this line. If you cross this line the knife will rotate. So hand should not dive deeper than your knife. [Ed. note 3]. To throw from 8-10 M you initiate a wave from foot to knife, like a lash, and this will cause the knife to fly out of your hand straight [Ed. note 4]. In sport knife throwing, some people put their right foot forward, some their left, but you don't usually see the strong hip rotation shown on your video. Can you comment? Sport knife throwers have time to position themselves any way they want. In combat, one can not choose one's position. Throwing might be necessary from very inconvenient and uncomfortable positions. Sitting, lying, under cover, etc. You don't care about which foot goes forward, or rotating a hip. All of these things are for learning purposes only. You show students pulling knives from sheaths at their belt, or throwing as if from behind their back, but they all would pull, reset themselves, and then throw. Why can't knife be thrown immediately from the sheath without the extra motion? There are different types of knives. Some can be thrown immediately in the draw. This is called the economic throw, or motion saving, but the video is showing some illustrations of student activity in class, and does not cover everything. You always throw across your chest. Does this add power to the throw? Again, this shows the difference between sport and combat. We must throw from any direction to any direction. What is ever most convenient at the moment is acceptable. Under what circumstances does it make sense to throw your knife? Many of the throws you show in your video are so close to the target that it seems you could close the distance and use the knife in your hand. Why or when would you throw from 2 meters? Situations where a throw might be necessary include: 1, when your target can run away, and 2, when you are not afraid to loose the knife. The knife is a good weapon, but you can not always rely on it in your own hands unless you are an expert. Even many trained people do not have fighting experience with the knife. You can practice with open hand techniques, but you can not work out realistically with real knives. People to not work with knives properly. Knives slip, they aren't held right, etc. Was throwing a significant part of your close quarters combat training? Were you issued throwing knives? You can throw anything. If a person runs and you must stop them, you might want to throw something. You normally don't want to throw away your weapon, but if you have an opportunity you must take it. We practiced throwing: knives, tools, shovels, rocks, but we were not issued special throwing weapons. Normally knives used in sport are long and heavy. What comments can you make on size and weight? For me this is irrelevant. One must learn to work with anything, fork, spoon, knife. If you prefer some special kind of knives, you will come to depend on them you will not be able to use anything else with equal effectiveness. You must learn to work with everything. One advantage to a bigger knife is that it may still disable your target, even if it doesn't hit on the point. With a smaller knife, you must be very precise, and must hit an eye or vital artery in the neck. You must think more about throwing the small knife, and be very well trained. Bigger knives can be thrown into the chest, smaller ones into the face. I'm sorry, I don't know. If you put on table 10 different knives, ten people will choose different knives based on their experience. Different knives work best in different situations. What wars did a particular people experience? This affects their military selection of knives. What about knives for throwing? Are there any particular characterists to look for? I am not a big specialist in knife throwing. I teach and demonstrate it. I am more a specialist in working against knives, but I can throw anything..
For those who may be interested, it is said that Mikhail Ryabko is one of Vladimir's teachers! In early 2000, I encountered professor Marinas' book and throwing knife. His experience, and approach seemed to fit in well with my two existing martial arts articles, so I asked his permission to interview him on the subject of throwing, his knife, and his book. I sent professor Marinas a list of preliminary questions, then spoke with him by telephone for an hour going over them. A week or so later, I received a written reply to the questions by email, and have combined the two, along with his answers to a few clarifying questions, in this interview. professor Marinas has taught stick and knife fighting for 28 years, and has been a practitioner for far longer. His great uncle was his teacher. The term Pananandata means "art of weaponry". Besides his Guide to Knife Throwing, professor Marinas has published Pananandata Knife Fighting (Paladin Press 1986), and Pananandata Yantok at Daga (Paladin Press 1992). A second book on knife throwing, focusing on underhand techniques has been accepted, but not yet scheduled for publication by United Cutlery. professor Marinas has also designed a second throwing knife, the CM Tala, which is to be made available by UC sometime this year (2000). The throwing knife produced in two sizes by UC and designed by professor Marinas is called the VM Bulalakaw. The smaller of the two is 8.75 inches in length and weighs 4.2 ounces. The larger is 10 inches and 10 ounces. The blade is shaped much like that of the Cold Steel TFT, a spear point, 1 & 1/8 inches wide through most of its length, hollow ground from a line about 5/8 of an inch from the sharpened blade. The thickness of the larger knife, 7/32 inch, accounts for its weight. It has the best weight/length ratio, for a thrower, I have seen in a commercial knife since the disappearance of the Black Jack broadhead. The knife is handle heavy, caused in part by the extra width in the handle which swells slightly to 1 & 3/16 inch at its widest point. At the point of contact between handle and blade there is a slight slope downward at the spine opposite an uppward offset from blade to handle on the blade side. The effect is to raise the axis of the handle slightly above the axis of the blade. The handle also has a downward protrusion at the end of the handle, something one sees on many field and fighting knives, but not typically on those designed for throwing. We began the interview discussing these features. THROWER: Is there a reason why the center axis of the handle is above the center axis of the knife? A.M.: No, it just happened that way, a consequence of the shape of the handle. In designing this knife, I gave UC only a general specification, the knife's weight, the location of its center of gravity, and the shape of the handle. THROWER: What about the bump at the end of the handle. A.M.: I put the bump there specifically for my underhand throw so that I can speed up its rotation as it leaves my hand. This is discussed in my second book, and in my third manuscript on knife throwing. The way I throw underhand, the handle lies in the palm with the blade (and the bump) to the right. When making the throw the bump helps to spin the knife around either its medial or logitudinal axis. I also use the bump for my over hand throw, again to speed up rotation when necessary. The bump also ensures a more secure grip when the knife is used in hand to hand combat. 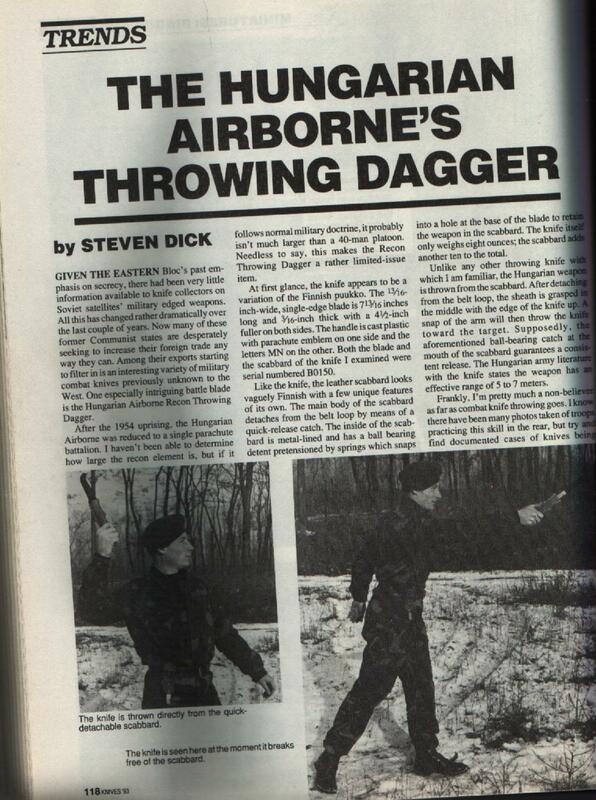 THROWER: From the smoothly tapering handle of most throwing knives, one can speed up rotation by holding less of the handle in one's hand, or breaking the wrist in the throw. A.M.: I do not like these techniques. Holding less of the knife means you have less control, and breaking the wrist, while sometimes necessary, adds one more variable to be practiced and controled. Using the bump as a means to accelerate rotation, or avoiding it when necessary, is not too hard if you are used to the particular knife. The steel used for the two knives is 420J2 stainless. Concerning hardness professor Marianas said "This is not one of the factors that determine whether I will buy a knife or not. For this reason, I do not pay any attention to it. I buy a throwing knife mainly for two reasons: a) I do not have it yet, and b) it feels good in my hand. I throw wooden darts and plastic chopsticks in which case Rockwell hardness is quite meaningless." We turned to grips. The book pictures a number of grips both from blade and handle on page 38. There is also his preferred "straight fingered grip" which is similar to the "Katsumi Toda" grip in photo (b) on that page. With shuriken, the first and third fingers may cradle the spike, while with small knives, the fingers remain parallel to one another. professor Marinas' grip is well illustrated with many implements on pages 49 through 67. At the same time, he doesn't feel comfortable with the pinch grip and the McEvoy style grip from the blade side shown on page 38. For him, the pinch grip does not give enough control unless he is working with very light knives, while the McEvoy style is not suited to working from the blade of a sharp knife of the sort with which he trains. Concerning his "straight fingered grip," he had a lot to say. THROWER: On page 44 you discuss the placement of the blade tip in your palm. As the knife gets longer, you instruct the reader to place the tip further down, towards the wrist, to rotate the larger knife (1/2 turn) at the same distance as the smaller. This seems contrary to my experience in which the knife rotates more slowly when more of it is held in the hand. Can you explain? A.M: A short knife will have a short handle. A longer knife will have a longer handle. Hence, for a longer knife, at the same time that you will have more of it in your hand, you will have more handle of the knife jutting past your palm. Note that I keep the center of gravity of the knife at or close to the tip of my index finger. (professor Marinas went over this again in our phone conversation. Indeed, the secret of this grip seems to be the ability to control the knife at the last moments of release by the index finger at or near the center of gravity. Ed.). Throwing underhand, I grip my knife (the VM Bulalakaw) six different ways by the handle and two different ways by the blade. Throwing overhand, I grip two different ways by the handle, and two different ways by the blade. Counting and remembering the number of rotations for each of these twelve will become mental clutter. I am more concerned with how to control the rotations of the knife. THROWER: You seem to throw mostly 1/2 and 1 turns of the smaller knives you favor, yet achieve almost equal distances, about 17-18 feet with either throw. A.M.: You are absolutely right. I can make adjustments on the lighter knives. I can not describe the adjustments though. It has become instinctive to me. I plan what I want to learn in each of my throwing sessions. For example: One particular day, I would throw a new knife from the same distance using the handle grip underhand, and the blade grip overhand. I do not stop until I get the knife to stick. For some knives, it has taken me a couple of thousand throws, but eventually, I manage to do it. I throw the smaller version of the VM Bulalakaw from the same distance using (a) blade grip overhand with my right hand (b) handle grip underhand with my right hand (c) low backhand with my right hand originating from beside my left leg using the handle grip, and (d) high backhand with my right hand originating from above my left shoulder using the handle grip. THROWER: I know a man (Bob Karp) who uses a grip that looks much like your "straight fingered grip" overhand with a long and heavy knife achieving great distances with it. I find it very hard to control such a knife with this grip and have had little success with it. A.M.: I discuss this in my second knife throwing book. One needs a large hand to control a heavy knife in this way. I found a better way of dealing with a heavy knife, I throw it underhand! THROWER: In describing your distance change from one turn to two, your distances seem to close to exact multiples. My experience suggests that this is never the case because the knife must travel a more pronounced arc the farther you are from the target. A.M.: I did not say "exact multiples", I said they seem to be multiples. There is a difference. You brought up a good point though, the difference between the ground distance to the target and the true path of the knife. I believe (I am not sure) Harry McEvoy measured his ground distance using his back foot as a reference. Others, like me, measure it from the front foot. The distance from the point of release to the target, your true path, as well as your ground distance, is discussed in detail in my third manuscript. The true path is the distance x in the mathematical equation for the trajectory of a thrown knife (page 6 in the present book in a chapter called "Physics of Throwing" ed.). I find it easier to teach knife throwing by not even mentioning the phrase "number of rotations". To a beginner, this is mental clutter. All I tell a beginner is "Stand right here, put your front toe on this spot and throw." Then, depending on how the knife hits, I make him move several inches (at a time) closer or farther. THROWER: professor Marinas throws very hard. Indeed his cross-body whip like motion (I have not seen it, he could only describe it) is probably the secret of making effective use of a light knife as a thrown weapon. Basically, he throws really fast! I asked him about this, particularly as it affects stress on his shoulder, elbow, etc. A.M.: I started throwing when I was young with the bagakay. The bagakay I now use weighs about 19 grams (about 2/3 oz. Ed.). Perhaps it was to my advantage that I started with such a light throwing object. I do not have any problem throwing a very light weapon on one throw, and throwing a heavier knife in the next. Whether I throw a light or heavy weapon, I throw just as hard. I throw plastic chopsticks. I sharpen one end though, otherwise the chopstick buckles and breaks. If your throwing technique makes use of arm power only, then you could be hurting. The power of my throws comes from my hips which is then transmitted through the body twist to my arm, then elbow, and finally to the wrist. If I feed fatigued when I throw 200 times in a row, I take a few minutes rest. I drink some water or fruit juice in the summer, hot tea during cold months. When I resume throwing, I throw with my other hand. Throwing with the right, then with the left hand will extend a knife thrower's throwing days. I throw both over and underhand with my left hand. I vary my throwing routine in other ways too. I throw light knives one day and heavy the next. I train with sticks the same way. I use light 31 inch sticks for most of the week. Once a week, I train with a 2 pound stick! THROWER: You mention a "no rotation throw" from short distances. I have only heard of this in a book on shuriken throwing by Shirakami Ikku Ken. A.M.: This is not really an exact description. I could not find a better word or phrase. A knife will rotate when thrown. However, before it has a chance to rotate noticeably, it sticks on the target. For this reason, the knife will seemingly not rotate. THROWER: Your book illustrates both right foot and left foot forward stances. Your favored throws are always across the body. A.M.: My throwing stance is a carry over from my stick fighting training. Left to right stick swings are more powerful if the right foot is initially in front. Right to left swings are more powerful if the left foot is initially in front. The same basics apply to my knife throwing. I can understand your buhat araw throw (right hand straight down on the right side in a vertical plane described on p. 77 ed.) because you use heavy knives. You do not need to twist your body. Throwing a 2 oz. knife is a different matter. I have to twist my body to generate the power required to make my knife penetrate the target. You can find many analogies with Tennis. A right handed tennis player will serve with his left foot in front. He will hit a backhand with his right foot in front. These are the same basic foot positions I use when I throw my knives. THROWER: We turned to realistic self-defense situations. A.M.: Many who read my knife throwing book might be of the impression that I would automatically throw a knife in my hand. I also wrote a book on knife fighting (see above ed.) where the knife/knives never leave my hand. A reader who reads only one of these books may make a wrong assumption. The knife is but an object that can be replaced. I would try to use what is around me if anything. I might throw a tomato or an apple at an opponent, or a can of anything if I happen to be on the canned goods isle of my supermarket. When I train to throw knives, I also train to throw grapefruit; among other things. There are two reasons why I throw lighter, smaller knives. First, In Queens (a borough of NYC) I threw knives in a basement with 6 foot ceilings. Big knives were out of the question. For this reason, I threw my small knives on a diagonal or sideways. I now have a sixty by one-hundred-twenty foot back yard. I can throw big knives if I want to. The second reason has to do with what is reasonable to carry in an urban environment where you are most likely to have to defend yourself. In the field, you can carry a 14 oz. knife if you wish. In an urban setting, you will have a boot knife, or a folding knife such as a lockback or liner lock weighing less than 4 ounces! I do also train with lockbacks, liner locks, switchblades, and other knives that are not supposed to be thrown [professor Marinas made it clear in conversation that he plays this way only with inexpensive examples of such knives which he doesn't mind breaking ed.]. If I decide to carry a knife for self-protection, it will be a light knife. A speck of dust is very light, but has great stopping power if placed correctly! The last thing a knife fighter will do is stand still. If you are interested in seeing the footwork of my system, I have a videotape on 2-stick fighting. It is being sold by ESPY-TV or you can get it from me. When you see me raise my arm to throw, you have assumed that I will be throwing overhand. However, I might throw underhand. Or I might just fake a throw. You have also assumed that I will be throwing from 17 to 20 feet only. I throw from a wide range of distances. I have thrown about 750,000 times at targets. In all that time it is not logical to suppose that I have not tried many distances. Among other things I practice is throwing a knife on the run. Regarding the circumstances when I will throw a knife, my reasons are in the section on Self-Defense. I also have a section on defensive knife throwing in my 2nd book and in my 3rd manuscript. Of course, the best time to throw a knife is when you are able to make the opponent look someplace else. With such an opportunity, you do not have to be the world's best knife thrower. I notice that all three of these master knife weilders go to some lengths to emphasize flexibility and realism in training. Their advice is taken to heart by many students of self-defense arts, as is illustrated in this article, training with the weapons at hand is the key! Here is yet more on the subject of improvised weapons a number of which may be thrown, and two interesting articles with pictures. Both are from Black Belt Magazine, one about ball bearings as improvised weapons, and the other a Korean technique for knife throwing in martial arts. I've tried this one, it really works! 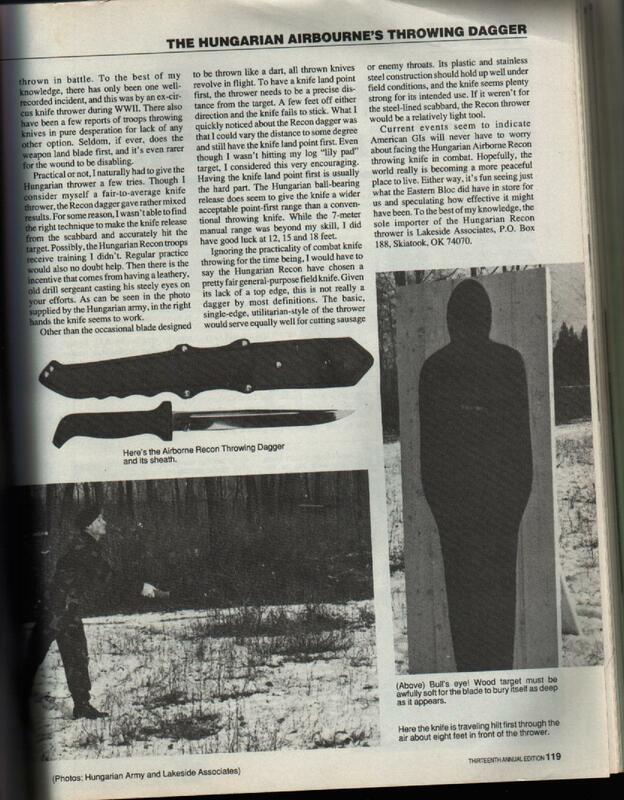 Lastly, I have a PART1 and a PART2 of an article from an old issue of Knives Magazine on a Hungarian military throwing knife.